Exchange traded funds are baskets of securities that trade intraday like individual stocks on an exchange, and are typically designed to track an underlying index. ETFs can be used to help diversify your portfolio. 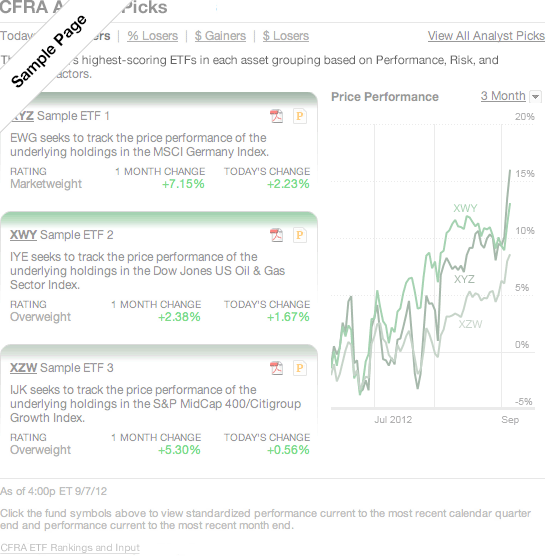 In order to access the CFRA Analyst Picks module, please log on to your TD Ameritrade account or open an account! From the SEC: risks associated with leveraged and inverse ETFs. Sell Underperforming Funds With Large Personal Unrealized Capital Gains? How Knowledgeable Are You About ETFs? What characteristic below is shared by Exchange Traded Funds (ETFs) and Mutual Funds? Click the fund symbols above to view standardized performance current to the most recent calendar quarter end, and performance current to the most recent month end. Performance data quoted represents past performance, is no guarantee of future results and may not provide an adequate basis for evaluating the performance potential of the product over varying market conditions or economic cycles. Current performance may be higher or lower than the performance data quotes. The investment return and principal value of an investment will fluctuate so that an investor's shares, when redeemed, may be worth more or less than their original cost. Before investing in an exchange-traded fund (ETF) or a closed-end fund, be sure to carefully consider the investment objectives, risks, charges and expenses before investing. For a prospectus containing this and other important information contact the fund or a TD Ameritrade Institutional Representative at 800-431-3500. Please read the prospectus carefully before investing. Past performance does not guarantee future results or success. TD Ameritrade receives remuneration from certain ETFs (exchange-traded funds) that participate in the commission-free ETF program for shareholder, administrative and/or other services. PLEASE READ IMPORTANT ADDITIONAL MUTUAL FUND, EXCHANGE-TRADED FUND, AND CLOSED-END FUND RISK DISCLOSURES. Short-Term Trading Fee (Holding Period for 30 Days). ETFs available commission-free that participate in the ETF Market Center may be subject to a holding period that commences with any purchase and extends through the following THIRTY (30) calendar days. An account owner must hold all shares of an ETF position purchased for a minimum of THIRTY (30) calendar days without selling to avoid a short–term trading fee where applicable. There is no limit to the number of purchases that can be affected in the holding period. Any order to sell within THIRTY (30) calendar days of last purchase (LIFO - Last In, First Out) will cause an account owner's account to be assessed a short–term trading fee of $13.90 where applicable. For the purposes of calculation the day of purchase is considered Day 0. Day 1 begins the day after the date of purchase. The short–term trading fee may be applicable to each purchase of each ETF where such ETF is sold during the holding period. The short–term trading fee may be more than applicable standard commissions on purchases and sells of ETFs that are not commission-free. There is no guarantee that a closed-end fund will achieve its investment objective(s). Past performance does not guarantee future results. The value of any closed-end fund will fluctuate with the value of the underlying securities and supply and demand in the secondary market. Until the original listing of a closed-end fund on an exchange, no closed-end fund's shares will have a history of public trading. Closed-end funds may trade at a premium or discount to their net asset value. ETNs are not funds and are not registered investment companies. ETNs are not secured debt and most do not provide principal protection. ETNs involve credit risk. The repayment of the principal, any interest, and the payment of any returns at maturity or upon redemption depend on the issuer's ability to pay. The market value of an ETN may be impacted if the issuer's credit rating is downgraded. ETNs may be subject to specific sector or industry risks. Leveraged and inverse ETNs are subject to substantial volatility risk and other unique risks that should be understood before investing. ETNs containing components traded in foreign currencies are subject to foreign exchange risk. ETNs may have call features that allow the issuer to call the ETN. A call right by an issuer may adversely affect the value of the notes. "Gross Expense Ratio" reflects a fund's total annual operating expenses as stated in the fund's prospectus and do not reflect any expense reimbursements or waivers that may exist. Some ETFs appearing on this List may be subject to expense reimbursements and waivers, and less such reimbursements and waivers may have lower total annual operating expenses (i.e., "net expenses") than indicated herein. Please read the fund prospectus carefully to determine the existence of any expense reimbursements or waivers and details on their limits and termination dates. Investors in Closed-End Funds please note that since these securities are not continuously offered, there may be no prospectus available. Sector investing may involve a greater degree of risk than an investment in other funds with broader diversification. Diversification does not eliminate the risk of investment losses. Leveraged ETPs (Exchanged Traded Products, such a ETFs and ETNs), seek to provide a multiple of the investment returns of a given index or benchmark on a daily basis. Inverse ETPs seek to provide the opposite of the investment returns, also daily, of a given index or benchmark, either in whole or by multiples. Due to the effects of compounding and possible correlation errors, leveraged and inverse ETPs may experience greater losses than one would ordinarily expect. Compounding can also cause a widening differential between the performances of an ETP and its underlying index or benchmark, so that returns over periods longer than one day can differ in amount and direction from the target return of the same period. Consequently, these ETPs may experience losses even in situations where the underlying index or benchmark has performed as hoped. Aggressive investment techniques such as futures, forward contracts, swap agreements, derivatives, options, can increase ETP volatility and decrease performance. Investors holding these ETPs should therefore monitor their positions as frequently as daily. Margin trading increases risk of loss and includes the possibility of a forced sale if account equity drops below required levels. Margin trading privileges subject to TD Ameritrade review and approval. Carefully review the Margin Handbook and Margin Disclosure Document for more details. Third-party research materials obtained from companies not affiliated with TD Ameritrade, and are provided for informational purposes only. All product and service names are property of their respective owners. Research Disclosure Notice TD Ameritrade pays various outside sources for research material regarding investments and securities that such outside sources distribute to their own customers. Any recommendation, opinion or advice regarding securities or markets contained in such material does not reflect the views of TD Ameritrade, and TD Ameritrade does not verify any information included in such material. TD Ameritrade assumes no responsibility for any fact, recommendation, opinion or advice contained in any such research material and expressly disclaims any responsibility for any decisions or for the suitability of any security or transaction based on it. Specifically, any decisions you may make to buy, sell or hold a security based on such research will be entirely your own and not in any way deemed to be endorsed or influenced by or attributed to TD Ameritrade. It is understood that, without exception, any order based on such research that is placed with TD Ameritrade for execution is and will be treated as an UNRECOMMENDED AND UNSOLICITED ORDER. Further, TD Ameritrade assumes no responsibility for the accuracy, completeness or timeliness of any such research or for updating such research, which is subject to change without notice at any time. TD Ameritrade does not provide investment, tax or legal advice. Under no circumstance is the information contained within such third party research to be used or considered as an offer to sell or a solicitation of an offer to buy any particular investment/security.